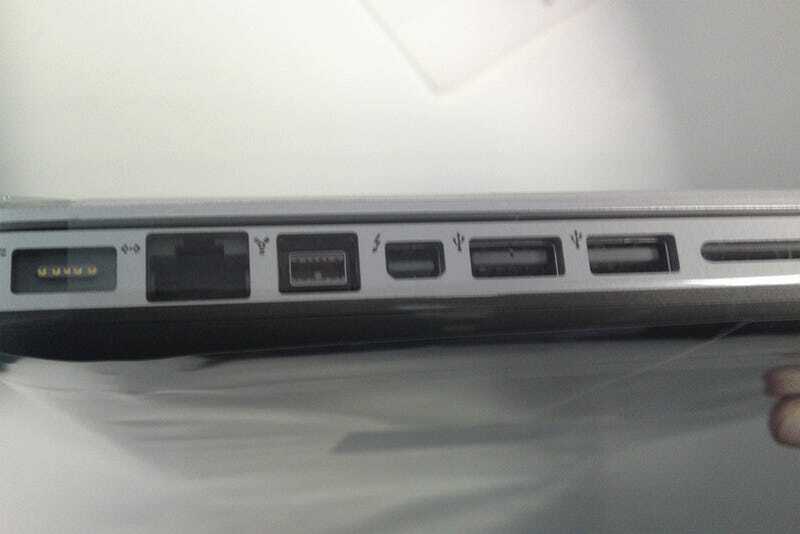 Apple's Thunderbolt connector has shown up in a supposed leaked pic of the new MacBook Pro, which we could see as early as tomorrow. While it looks just like a Mini DisplayPort connector, it could actually be Intel's Light Peak behind the lightning bolt icon. Now Light Peak, which has been around for a couple of years, was designed as a replacement for USB, FireWire and other ports (like the SCSI, SATA and PCI Express), but as you can plainly see in the photo above, the lightning bolt icon is shown alongside two USBs, FireWire and ethernet. Another leaked photo shows supposed Apple documents calling the technology "Thunderbolt," and listing the MacBook Pros as having Core i5 dual-core processors.